It’s our eighth anniversary! The traditional gift is bronze so we dipped Kevin in molten metal and set him on the shelf. It’s a real conversation piece, let me tell you. Okay but for real though we’ve gone back to the beginning – Kevin and Dayna live in one room for this episode, sorry not sorry. We’ve also updated the site with all the old episodes of Made Of Fail, so you can download them at your leisure! Links have been updated where applicable, and so has our podcasting guide! Dig around the website – everything should be nicely organized for your reading and listening pleasure! Our new opening theme was composed by Jason Froikin in Garageband and edited together by Devin Baker. Thank you guys! Marvel, you are Captain America-ing wrong. Reeeallly wrong. Jess Plummer wrote the definitive piece on why the Captain America twist is unconscionably deplorable. 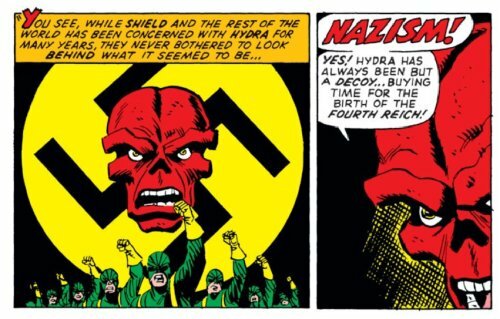 And yes, this DOES make Captain America a Nazi. See our image above. Peter David calls to Bernie Sanders supporters to come together with Hillary Clinton supporters for the sake of America’s future. We agree. John Scalzi writes about life’s “lowest difficulty setting” here. Voters can find sample ballots for their area here. SPECIAL NOTE: This recording took place before the tragic shooting at Pulse in Orlando. Lists of resources to aid the families of the victims are here and here, and here is how to find your congressmen if you want to tell them enough is enough. Made Of Fail loves and supports our LGBTQIA+ friends, family and fans. Yay you guys are back~!!! !